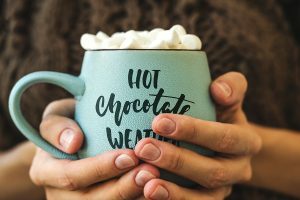 (even though its portrayed as a time to slow down and sip hot chocolate while walking in the snow), but it’s also really food centered which can be really overwhelming and triggering. As the month approaches, I think there are some things that can be helpful to keep in mind. Hopefully these suggestions will make the month seem a little easier on your heart and your mind. Drop the Expectation To Have and Be It All: This month is filled with unrealistic and unhealthy expectations around being and doing: parties to attend, outfits to buy, holiday events to go to, gifts to buy, and a positive holiday spirit to go along with it all. All of this pressure can lead to an increase in our anxiety and when we are anxious, we often turn our eating disorder. Instead, try to focus on how you want to feel over this month. Do you want to feel connected? Grounded? Happy? Peaceful? Once you know how you want to feel, start focusing on the things you can and need to do to make that happen. With that focus, the month starts to become your own and you get to fill it with the things that will actually fill your heart up. Have Realistic Recovery Goals: In my opinion, this is not the month to set yourself up to accomplish a bunch of recovery focused goals. For starters, it’s a month that is filled with triggers, food based and otherwise. In addition, because the month is typically emotionally and physically busy, your emotional and mental reserves are likely going to deplete more rapidly than at other times. If you are wanting to challenge yourself, set really realistic goals. For example, instead of challenging yourself to say yes to all the holiday festivities, pick the top 2 or 3 that feel the most important to you and commit to showing up and engaging in a way that would make you feel proud of yourself. The same applies to food. Don’t expect yourself to partake in every food challenge that comes your way this season. Instead, think of 1 or 2 food based experiences that you would like to have or like to feel successful at and stick with those. If we aim higher than we can manage, the disappointment and defeat can have a significant impact on our belief that we can recover. Set Time Aside For Self-Care: Self-care seems to have become a bit of a buzz word lately and is leaving everyone with thoughts of bubble baths and hot cups of tea. While both of these are great, self-care is actually less about the bath and more about intentionally doing the hard work of looking after your needs. Sometimes self-care is taking a long bath, other times it is saying no to a social engagement to stay home and prep your meals for the week so you can stay on top of your recovery. Many times self-care doesn’t feel relaxing until it is done. Often, it is doing the things that can feel hard to do in the moment but that make you feel better in the long run. This month you are going to be pulled in every direction on all levels. Set some time aside at least a few times a week to do some self-care and be sure to prioritize your wellbeing over the demands of the season.